Burgess tell me they've signed the 62.5m motor yacht Baton Rouge for sale and charter, now on the market for the first time. Delivered by Holland's Icon Yachts in September 2010, she was built to Lloyd's class with exterior styling by Tim Heywood. 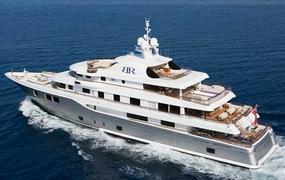 At 1,425GRT Baton Rouge offers more volume over her six decks than any other 62m yacht currently in commission. Accommodation for 14 guests in seven cabins is configured as a 100m² master suite on the main deck, two VIP cabins on the upper deck plus two convertible doubles/twins on the lower deck. The sophisticated interior, which blends town-house elegance with beach house chic, was designed by Redman Whiteley Dixon and features sculptured carpets, woven leathers and Brazilian Blue marble. Notable features include a pool with jet stream, an 80m² sundeck (convertible to a party deck) with an enormous round sunpad and a beach club lounge at sea level. An air-conditioned gym and a comprehensive inventory of water toys and tenders along with state-of-the-art entertainment and communications systems complete the picture of a very high specification superyacht.